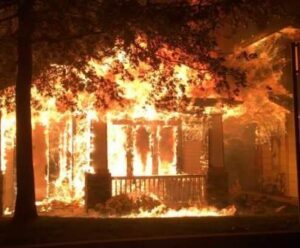 Tragedy strikes Northern California as a series of wildfires continue unimpeded, raging their way through the Napa Valley and Sonoma County areas, ravenously, consuming everything in their path. Numerous family homes, businesses and wineries lay charred, burnt to the ground. Thousands of residents are being hastily moved out of harm’s way. Helicopters were used to ferry some people to safety. Local hospitals in Santa Rosa, Sutter Health and Kaiser were safely evacuated. We have many friends in these areas, so, our first hope is that they, and their families are safe. In what is already being reported as being worse than the last, destructive 2015 Napa Valley Blaze” is rapidly on its way to eclipsing the number of acres destroyed. Over 20,000 acres were destroyed in the first 12 hours of the blaze. By mid afternoon, the sickening total of land consumed by fires grew to more than 50,000 acres. California Govenor Jerry Brown quickly declared a state of emergency in the counties of Napa, Sonoma and Yuba. The fires are thought to have broken out just before to 10pm, PST, Sunday, October 8. We use the word fires, because it’s possible that up to 20 different fires are currently burning their path, unimpeded through Napa Valley, Sonoma Coast and the Santa Rosa area at the moment. Smoke and ash were already drifting south to residents in San Francisco. The fire dangers are exacerbated by high wind gusts that have exceeded speeds of over 50 miles per hour at times. Those wind gusts serve to fan the blazes, allowing them to make large jumps, spreading even more destruction. Highway 121, Highway 128, Highway 29 and Highway 37 are closed. Fires are reported all over the region, in various appellations known for producing some of the best Northern California wines. Blazes are rapidly eating up everything in their path from Healdsburg, where residents were quickly evacuated. Fires are reported in Yountville, Atlas Peak along the Silverado Trail, Pritchard Hill, Mt. Veeder, Calistoga and Carneros are being threatened. 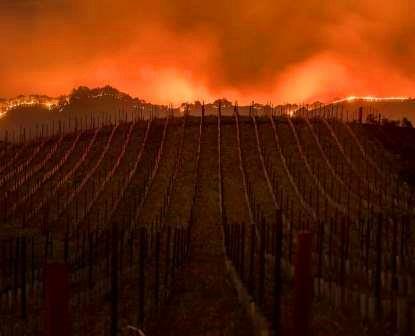 Some of the worst devastation is taking place in the Atlas Peak appellation. The Tubbs fire, in the Calistoga region is also out of control. In Sonoma, Kenwood and Glen Ellen have been slammed. That blaze has torn through many parts of Santa Rosa. Fires are also taking place further north, in the Lake County region, Ukiah, Forestville, Petaluma and Sebastopol. 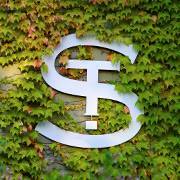 The popular Signorello Winery has suffered total destruction. The air is thick with the sickening stench of burn, that only comes from wildfires. Power is out in many areas. The full extent of the damage is not yet known. But it is going to be bad for people, pets, livestock, structures and businesses all over the region. However, it appears that folks in Santa Rosa have suffered the most destruction. In Santa Rosa, entire blocks of homes, mobile housing parks, offices, buildings and wineries were reduced to ashes. To say it’s heartbreaking, doesn’t go far enough. 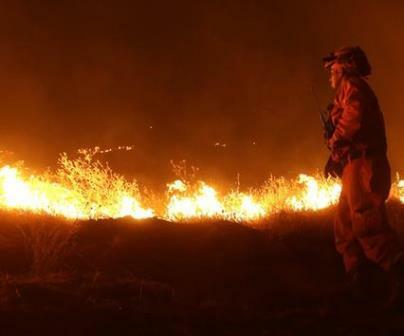 An army of more than 300 firefighters continue risking their lives hoping to extinguish, the numerous, out of the control, wildfires. Knights Valley in Calistoga all the way to Tubbs Lane. Residents off Highway 29, north of Tubbs Lane are being told to be ready, as they might tooo, receive, evacuation notices. So far, 3 main shelter centers to assist evacuees have been set up. To find the center closest to you, residents have been asked to text their ZIP code to 888777, which will send them alerts from Nixle regarding shelters, evacuation centers and news on the fires. The Napa County Animal Shelter at 942 Hartle Court will shelter dogs, cats, rabbits and other household animals. Evacuation information provided, courtesy of Napa Valley Patch.